Do you lose your scissors or other tools between you cutting table and sewing machine? We have a pattern for you! 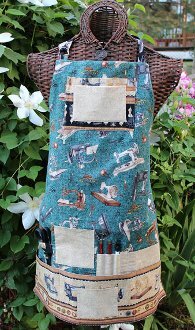 Includes a Utility Apron with pockets to keep your tools right at your fingertips. Also a Classroom Project Bag that can carry your Rotary Cutter, Rulers & Cutting Mat.